Summary: A more complicated and ultimately less successful proposition than the Bourne movies. 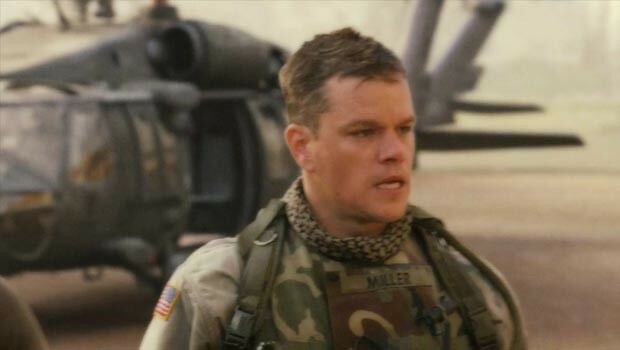 Iraq, 2003: Chief Warrant Officer Miller (Matt Damon) is smelling something fishy about intelligence that is continually leading him and his team to WMD hotspots with a distinct lack of WMD in evidence. His concern that “something’s not right here” is firmly suppressed by superiors when he voices it, but a CIA agent on the ground named Brown (Brendan Gleeson), urges him to follow his nose. After discovering an American journalist (Amy Ryan) who seems a little too informed about US intelligence, Miller becomes aware of Pentagon chief Clark Poundstone (Greg Kinnear), who is none too pleased about the direction of Miller’s enquiries. As Miller starts to see that there may be more than one side to the side he thought he was on, his pursuit of the truth becomes increasingly dangerous. Directed by Paul Greengrass and starring his Bourne leading man, it’s not hard to see why Green Zone has been dubbed ‘Bourne in Iraq’ – a tag that the film company are notably milking for all its promotional worth – but such shorthand is misleading. There is only one proper action sequence in Green Zone – albeit a thrillingly intense one – and it comes late in the film; for the most part Greengrass is doing something closer in spirit to a 70s conspiracy thriller. It’s like All The President’s Men but with more tanks and shaky camerawork. Correspondingly, Green Zone is a more complicated and ultimately less successful proposition than the Bourne movies; audiences will need to do some work to stay engaged. Greengrass and writer Brian Helgeland, adapting the script from Rajiv Chandrasekaran’s book Imperial Life in The Emerald City, do a brilliant job of recreating the confused American presence in Iraq, with all its disconnected and conflicting levels of authority. But they are less successful at bringing a story into focus, and the first half of the film lacks a clear direction. It’s also dissatisfying that the conclusion of the plot hinges on a very predictable action by a character clearly slotted into the story to fulfil that particular purpose; all the more disappointing a cliché considering that Greengrass achieves such authenticity in the film’s setting. But while his storytelling lets the film down, Greengrass constructs many individual scenes that have a powerful impact: in his first appearance, Jason Isaacs’ moustachioed general Briggs foregoes discussion and punches Miller square in the face, effectively summing up the impossibility of dialogue in this situation; Greengrass portrays the Green Zone itself as a virtual holiday resort, where Americans luxuriate by a pool mere miles from the ongoing conflict, again concisely presenting the problems at the heart of this occupation. To see such a pointed critique of recent history in mainstream cinema is a strong enough reason to recommend Green Zone, even if it isn’t the satisfying movie experience Greengrass has proven himself able to deliver in the past.